If you wish to book our vacation home you can use any of the book Now links found on our web pages for a direct link to our secure Home Away site which will provide you with an up to the minute availability calendar and secure instant booking capabilities. Further, you can also send an inquiry through our Home Away site or fill out the form below. If you would like immediate assistance you can contact us at 289-501-7500. Vacation Homes Niagara is located in the city of Niagara Falls, Ontario. 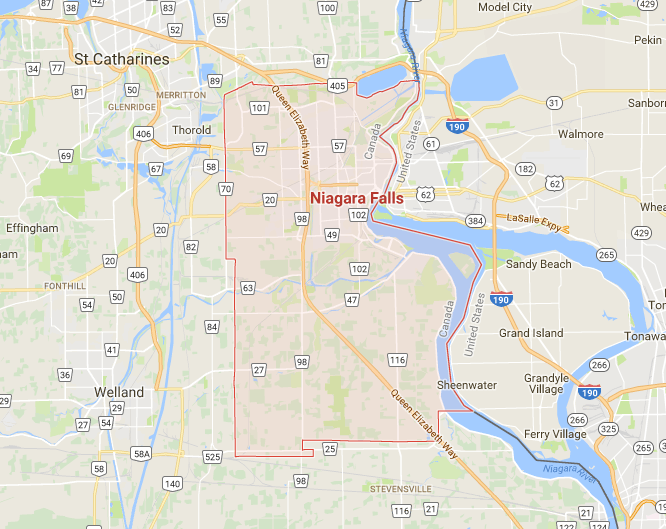 Below you will find some Frequently Asked Questions and a city of Niagara Falls map . If after reading these Frequently Asked Questions you still have additional questions please fill in the contact form below or call us directly and we will promptly reply to your inquiry. We look forward to having you as a guest. 1. Question- What time is Check in/Checkout time? 2. Question- What is the WiFi password? Answer-The Wifi password is available in the welcome book at the house. 3. Question- Can we walk to the falls from the house? Answer- Yes the incline railway is located across the street in front of the Embassy Suites Hotel. This is the -fastest route to the brink, taking about 10 minutes. 4. Question- How do we control the Heating/A/C? 5. Question- What is the configuration of the bedrooms i.e. beds? Answer- There are 5 bedrooms in total. Bedroom 1 upstairs, 1 Queen Bed, Bedroom 2 upstairs 1 Queen Bed, Bedroom 3 upstairs 2 twin beds, Bedroom 1 downstairs 1 Queen Bed, Bedroom 2 downstairs 1 Queen Bed. 6. Question- Does the home come with a BBQ? 7. Question- How do I get into the house? Answer- For ease at check-in we offer a key less entry system. About 1 week prior to your arrival a unique code is provided to you. (Disclaimer….If you are providing your email address above you are providing this to receive information/promotions/announcements etc. regarding Vacation Homes Niagara. If at any time you decide that you no longer wish to receive these emails you can easily opt out by emailing info@vacationhomesniagara.com).